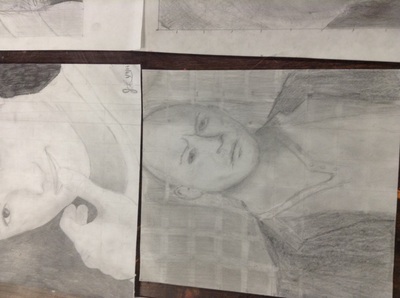 Students were introduced to the art works of Chuck Close. 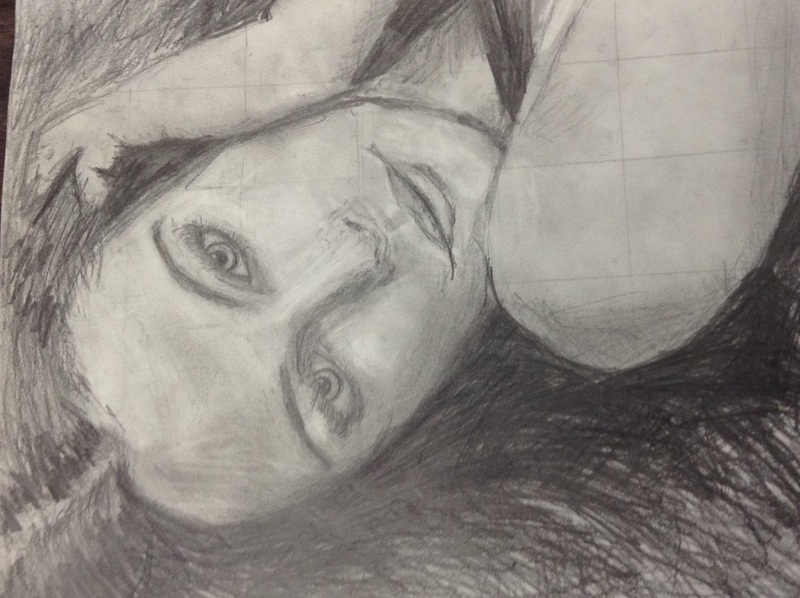 Chuck Close struggled with leaning and physical disabilities throughout his life. Breaking images down into a grid and drawing individual squares from the grid enables Chuck Close to draw realistic as well as abstract portraits. 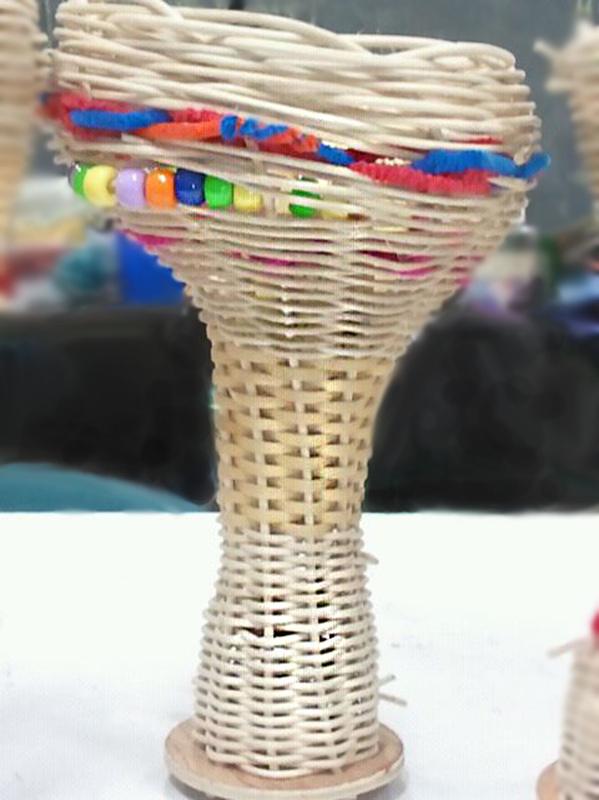 He is also able to scale them to a larger size. 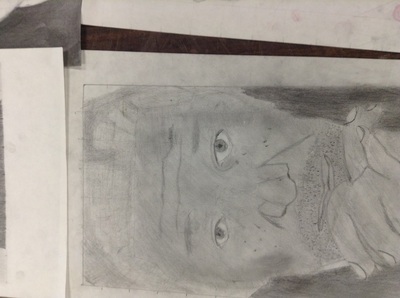 In this unit students chose a person who inspired them. 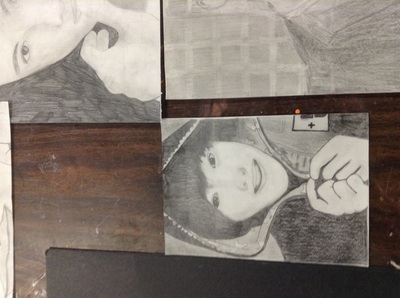 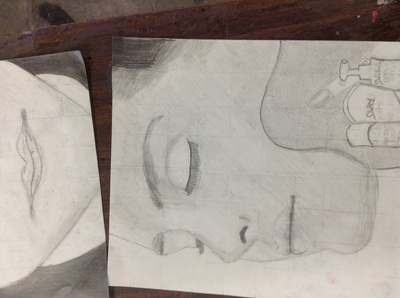 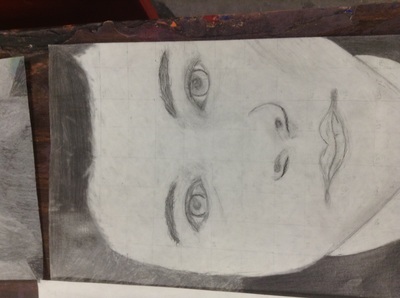 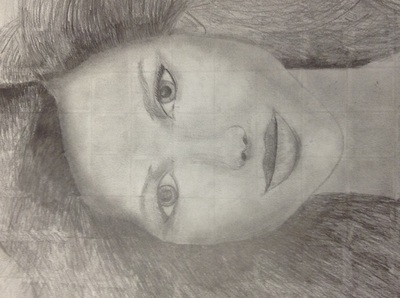 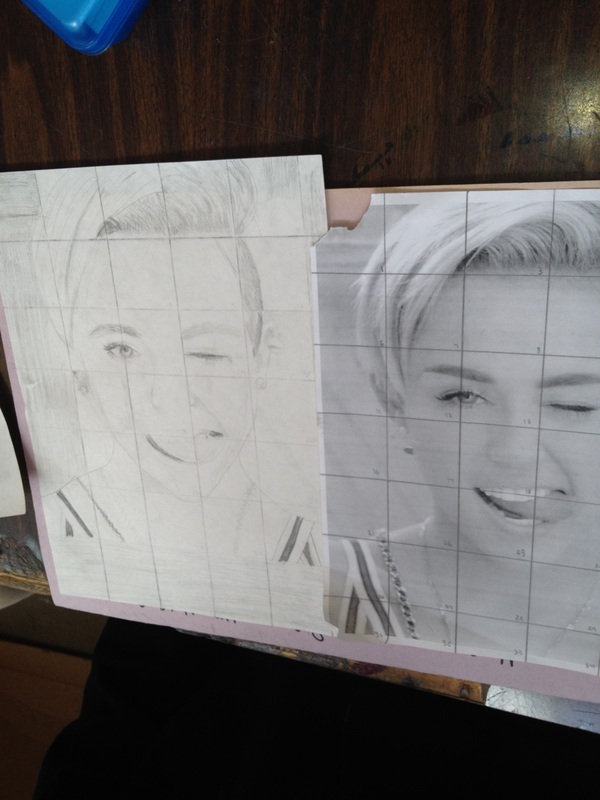 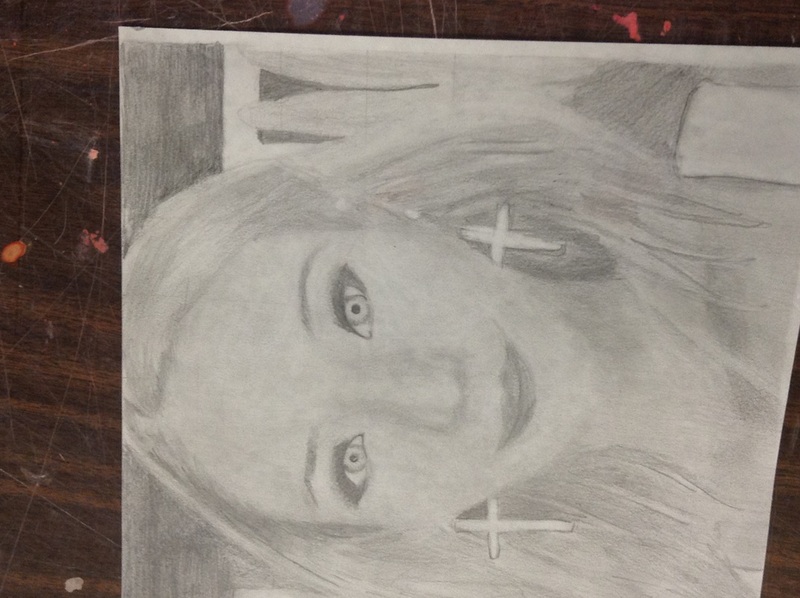 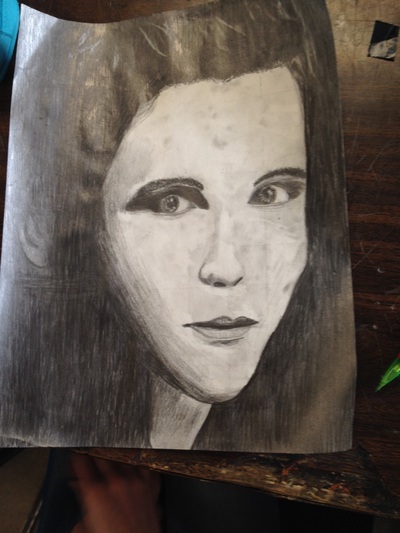 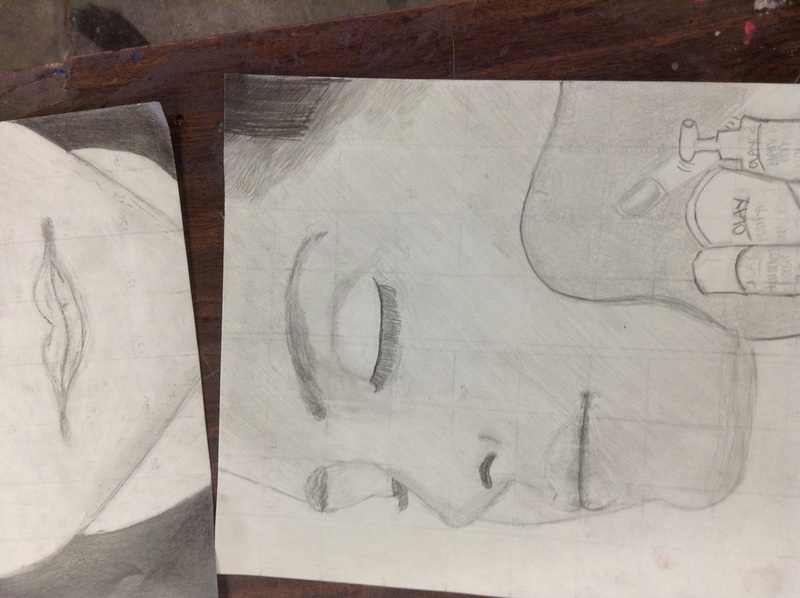 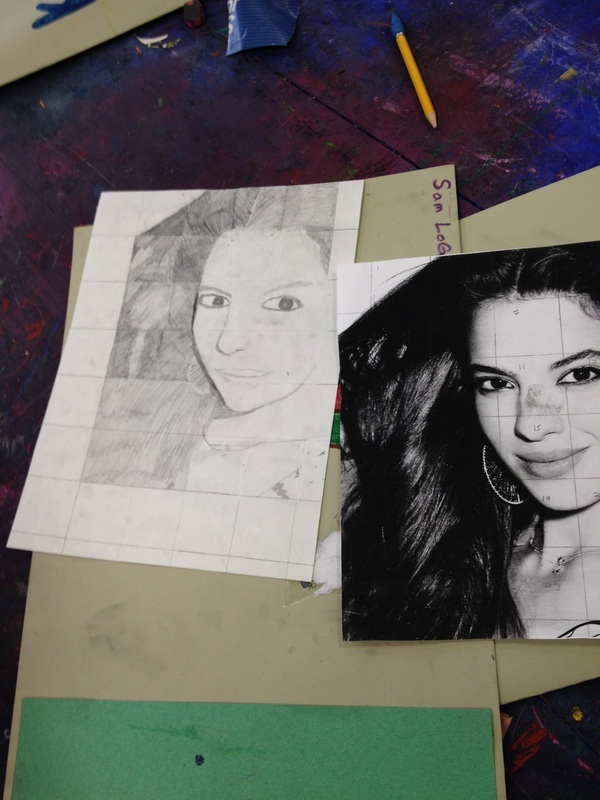 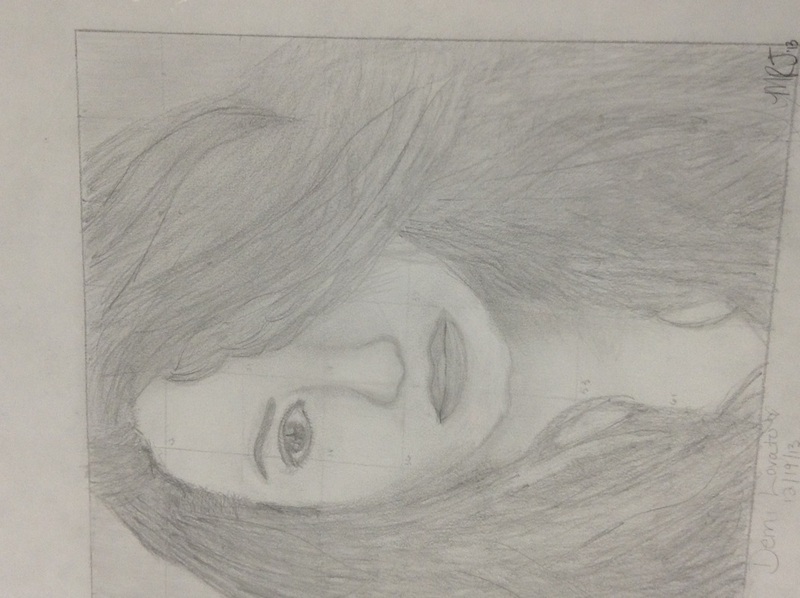 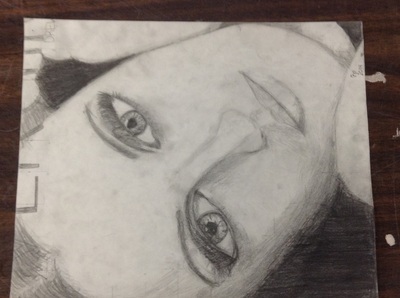 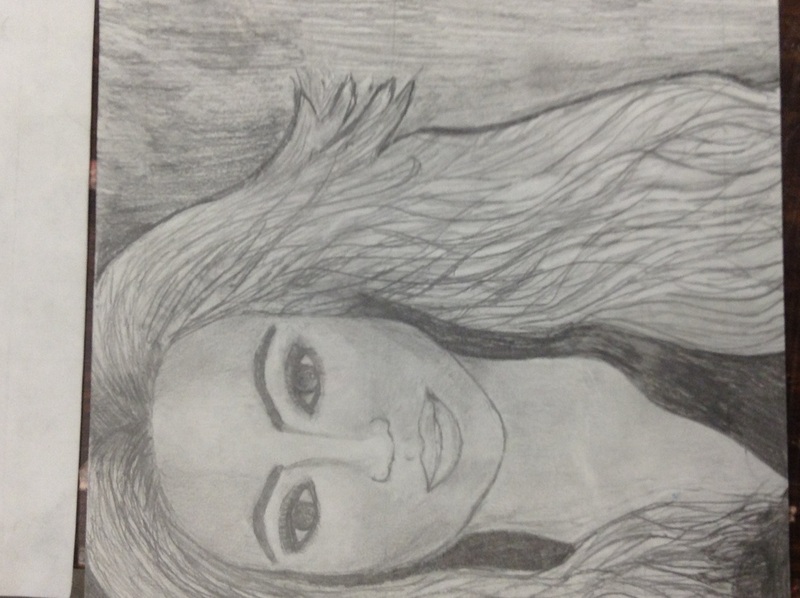 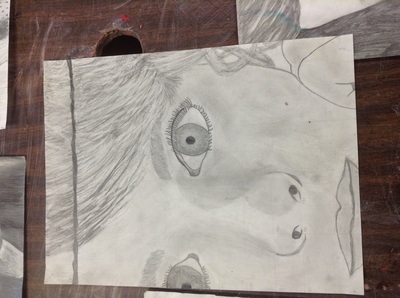 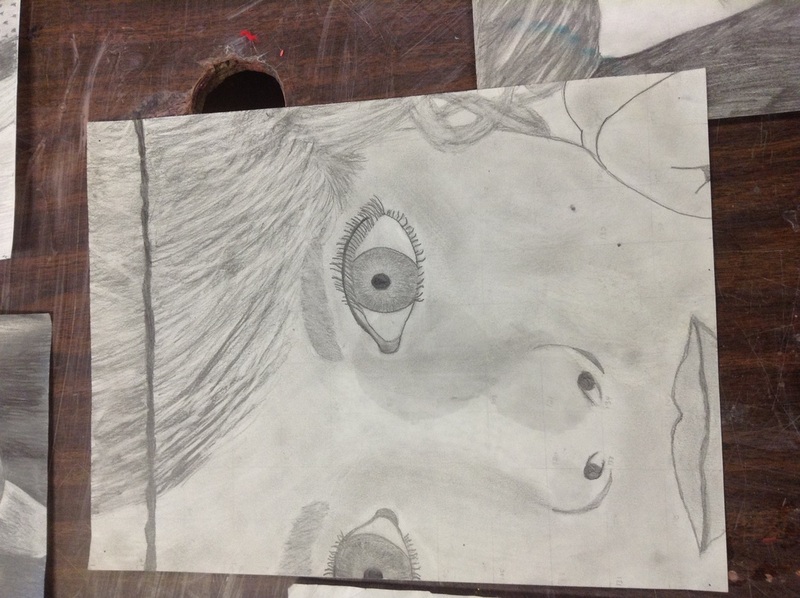 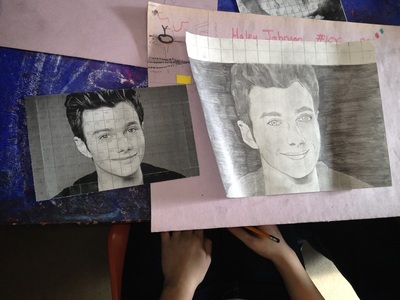 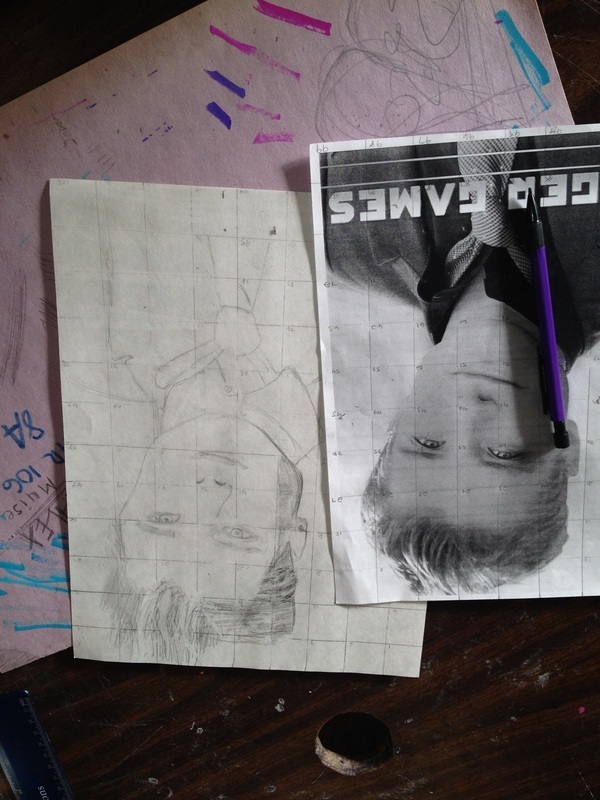 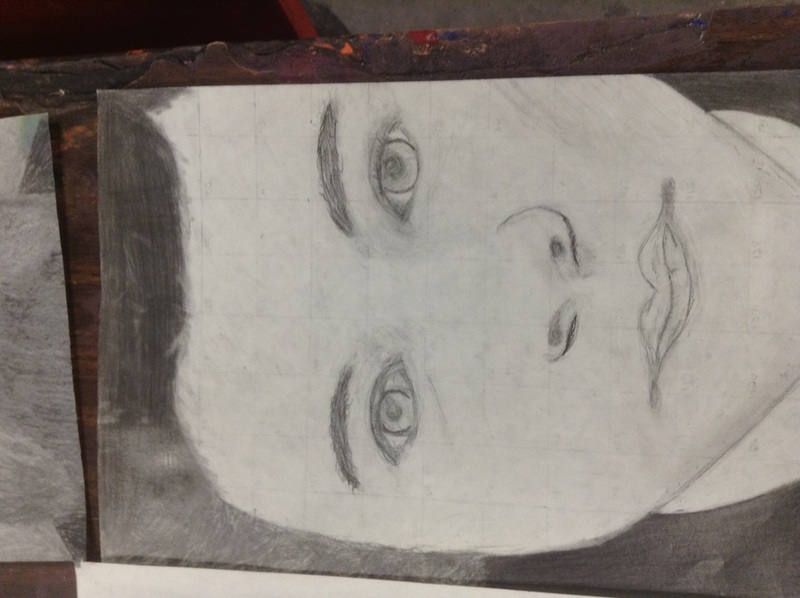 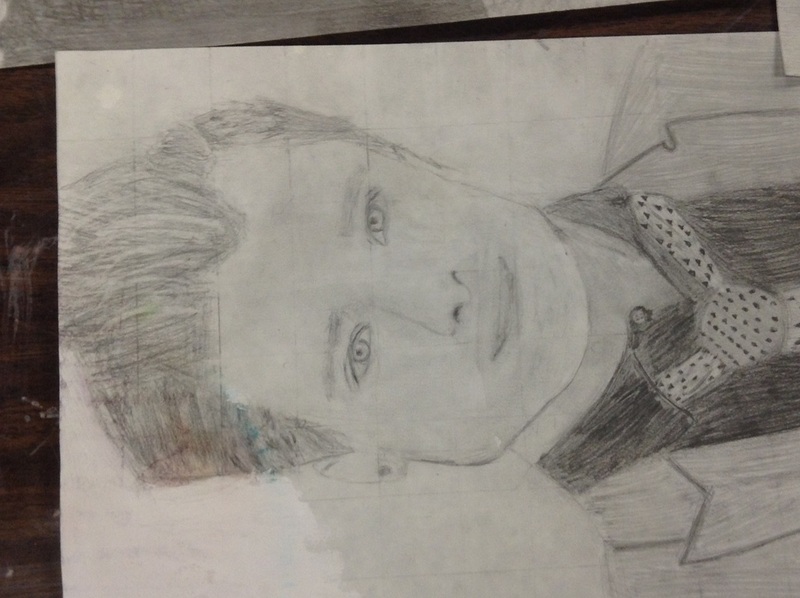 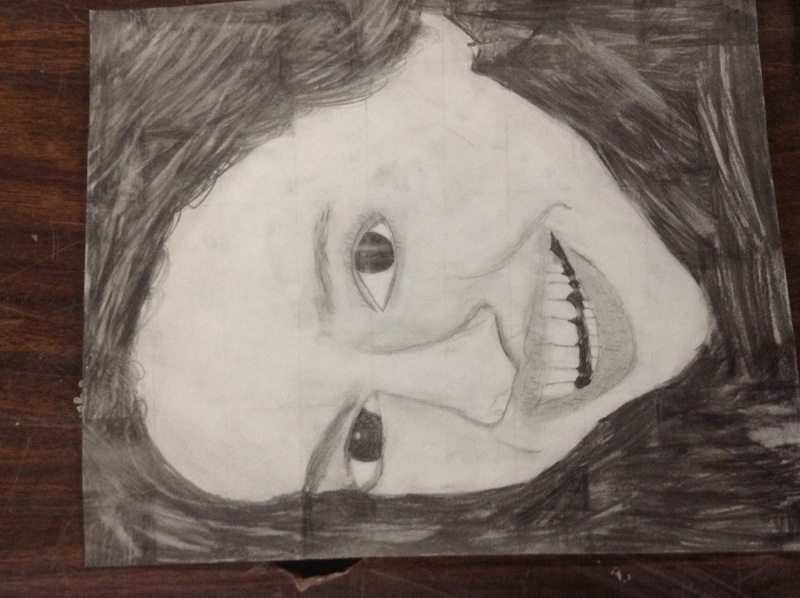 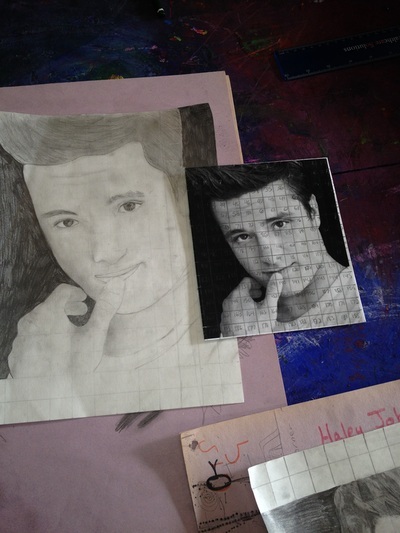 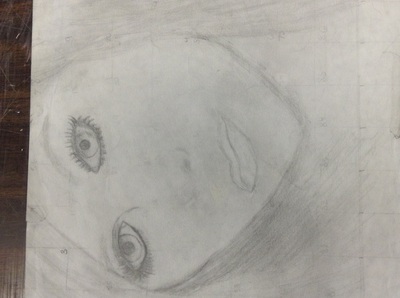 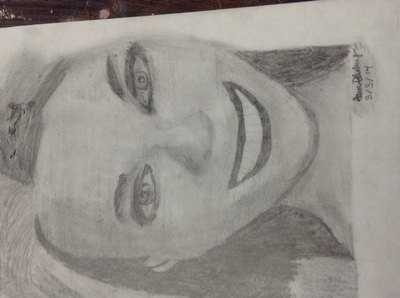 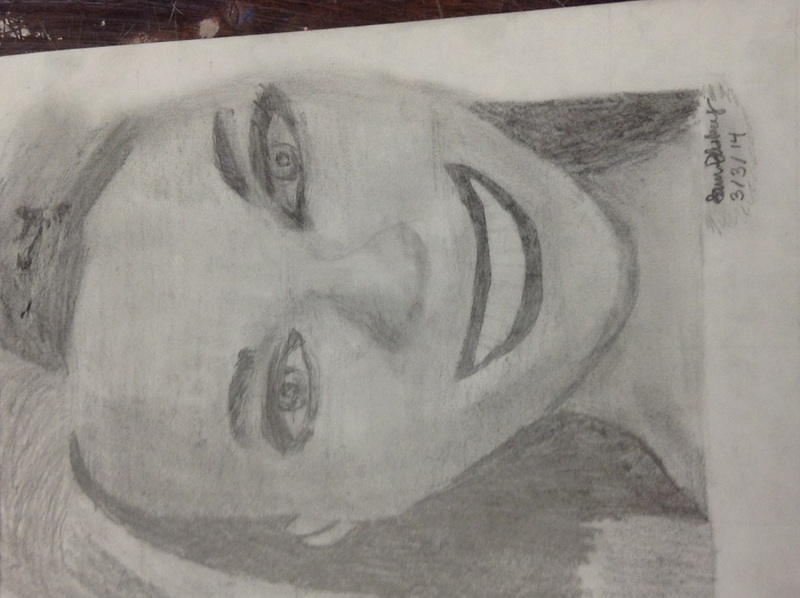 Using the grid as a tool, students created a realistic portrait. 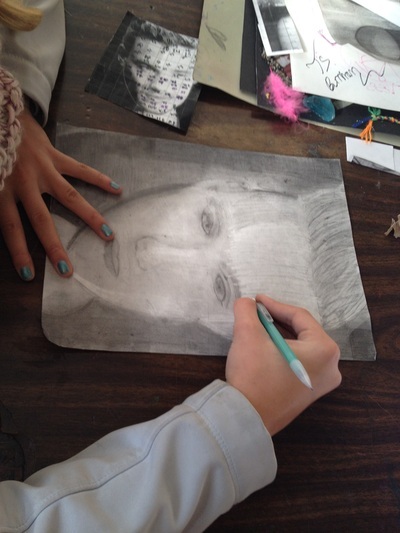 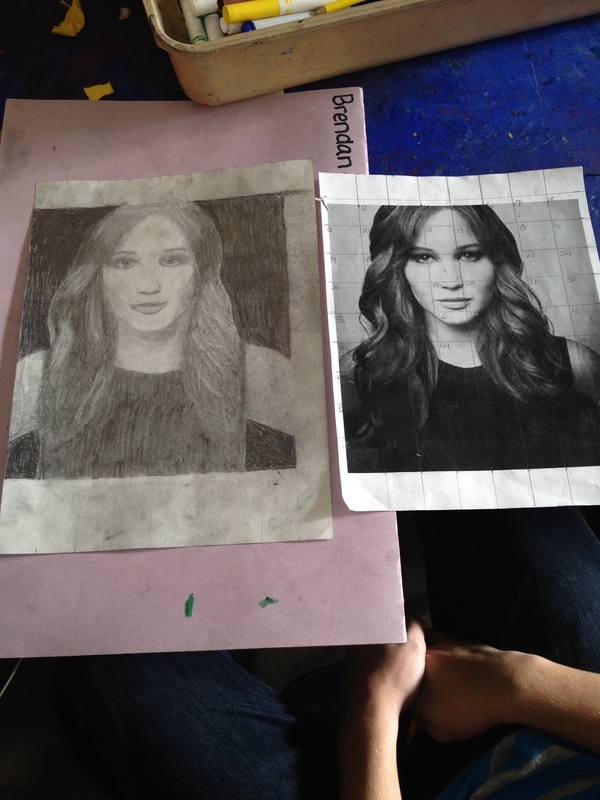 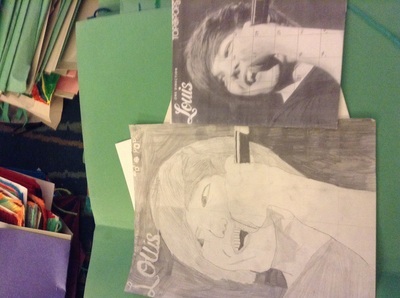 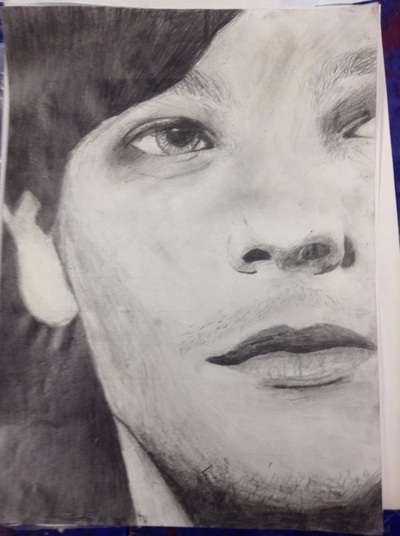 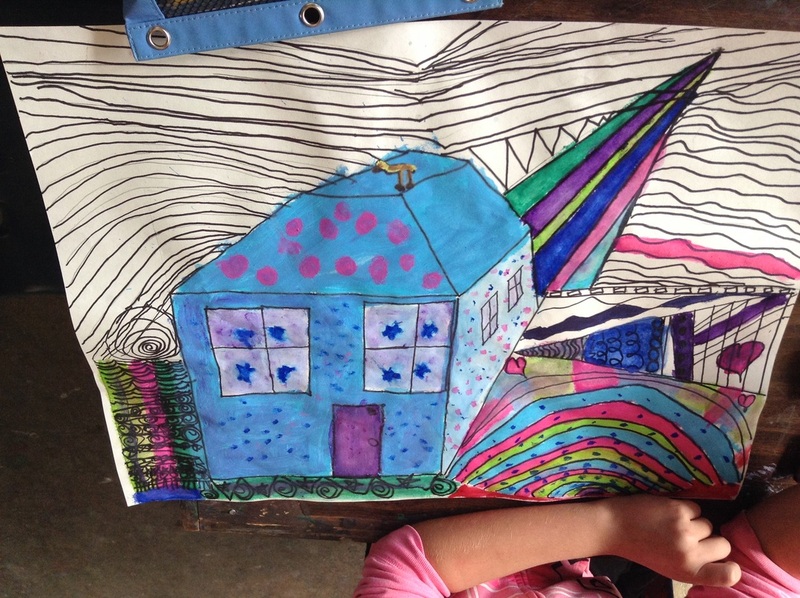 Although many students doubted their drawing ability in the beginning of the unit, they gained confidence in their drawing ability as they moved through the unit. Students also learned about how Chuck Close persevered through great challenges in his life and in his art and how his challenges made him the amazing artist he is today. Working from observation of photographs students studied perspective and color using magazine pieces as their "paint". 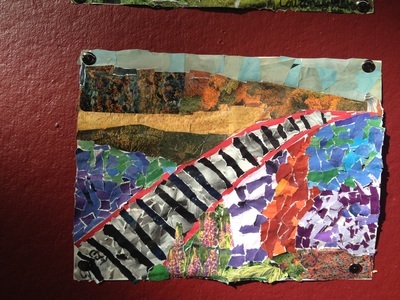 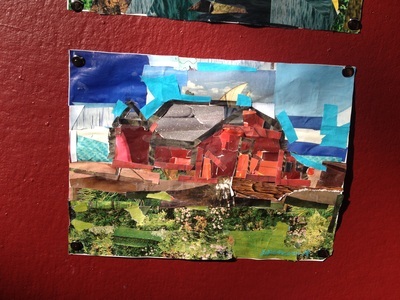 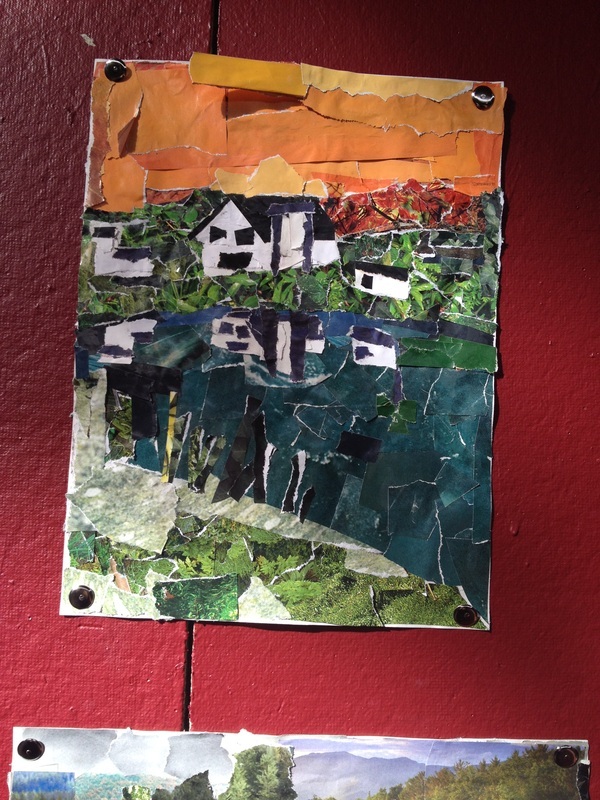 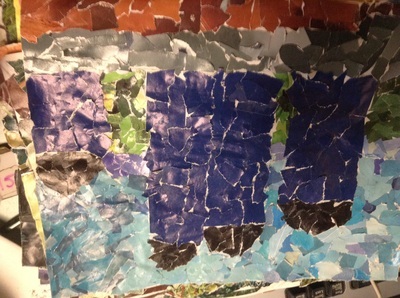 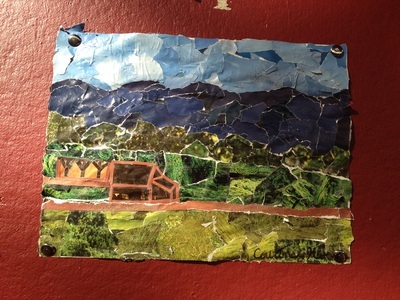 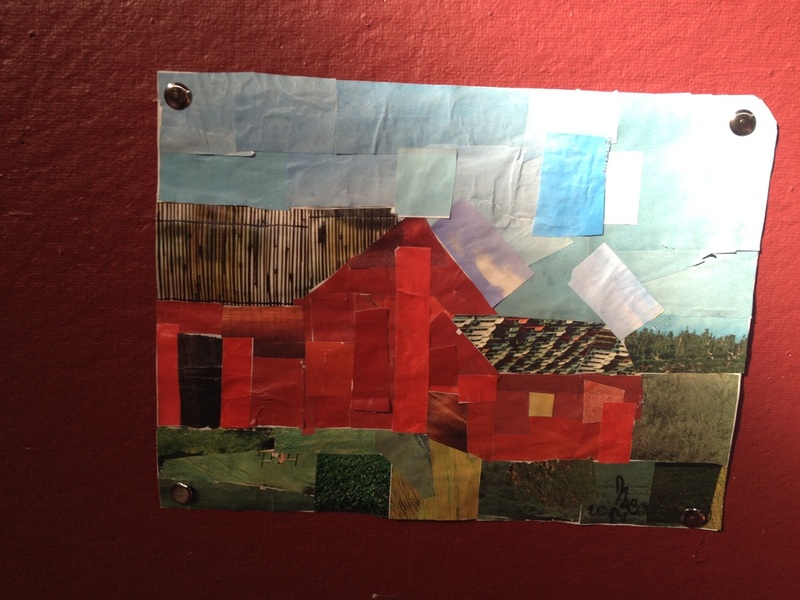 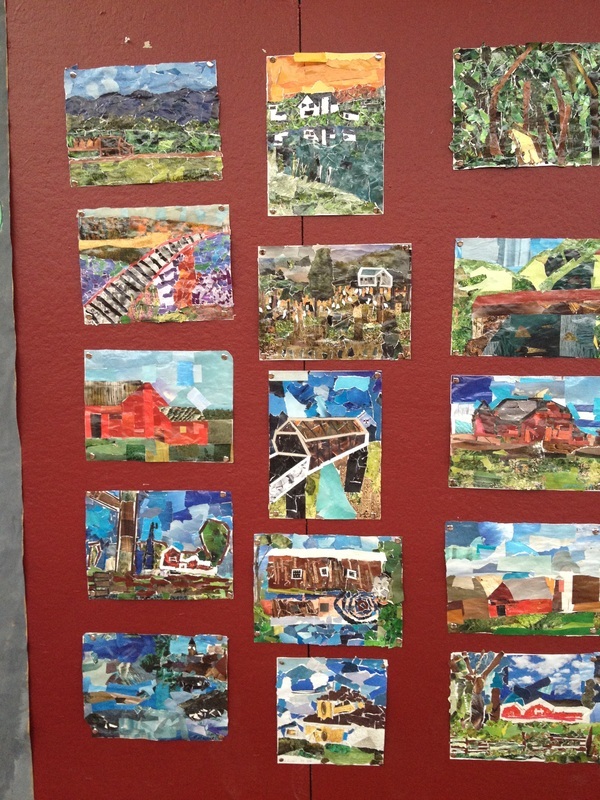 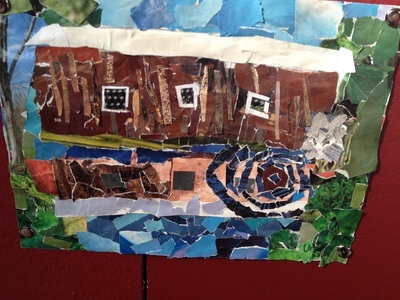 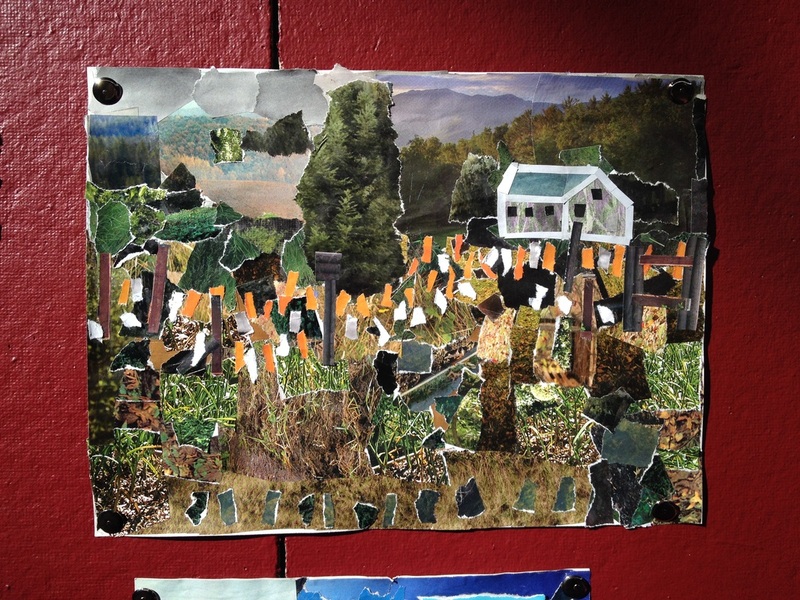 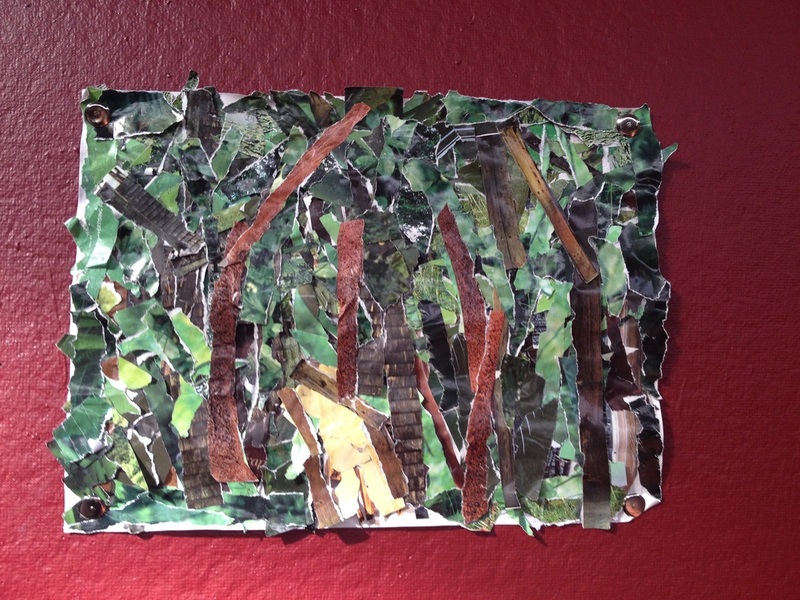 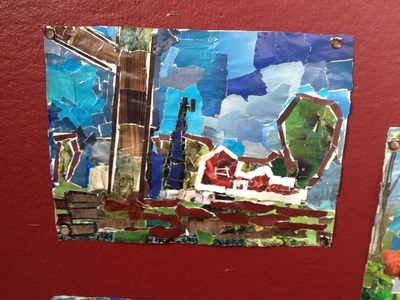 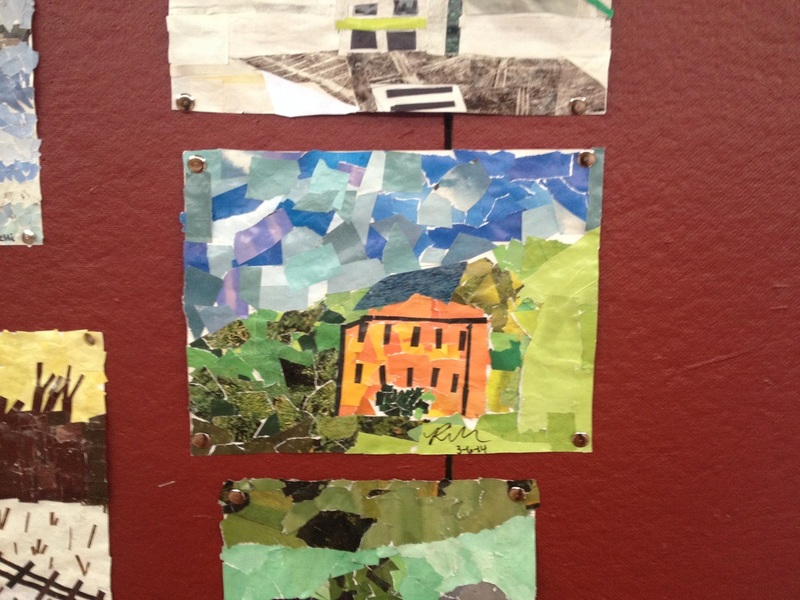 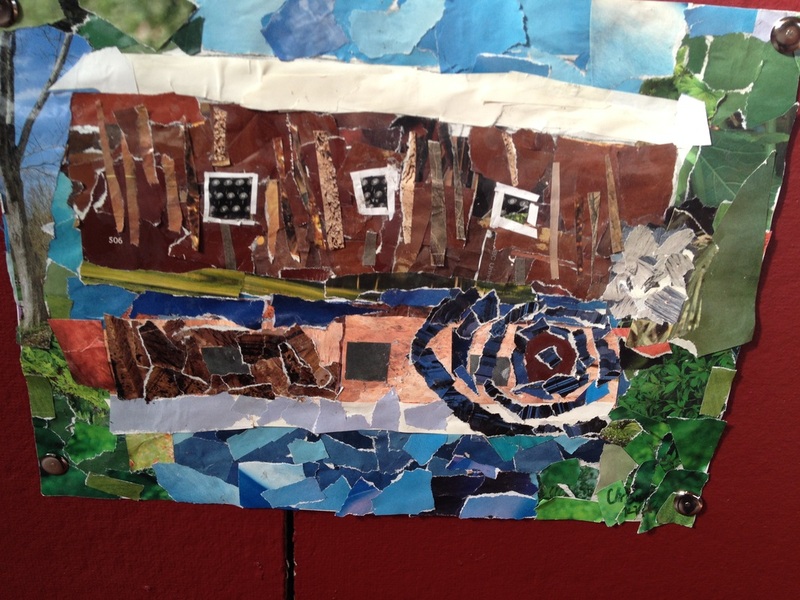 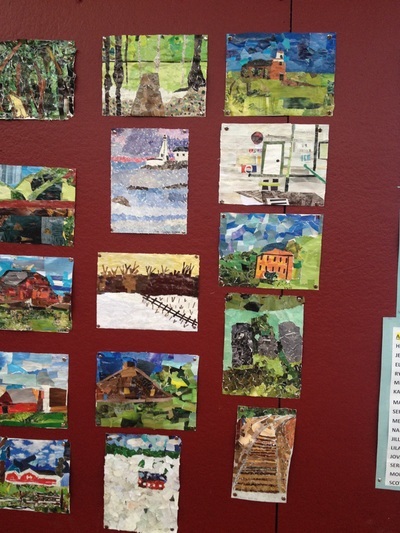 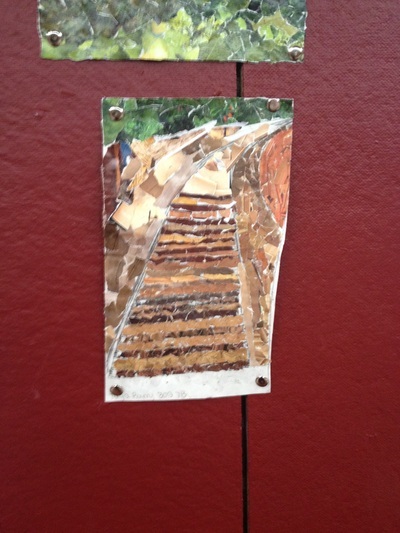 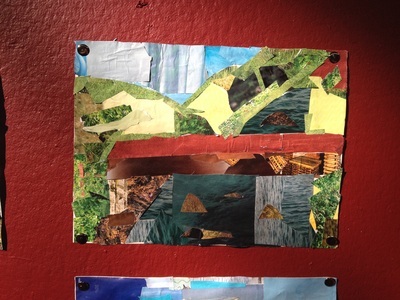 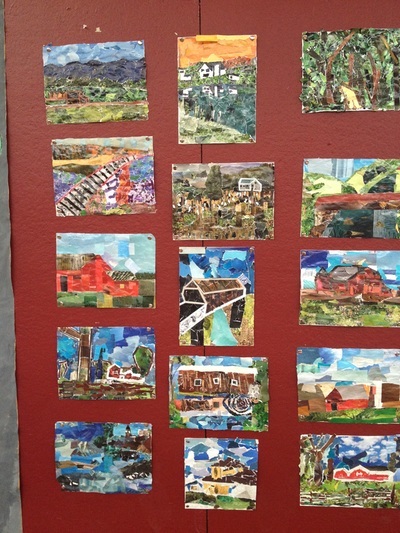 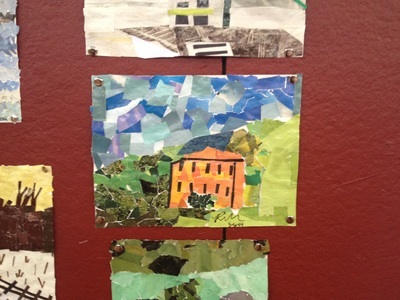 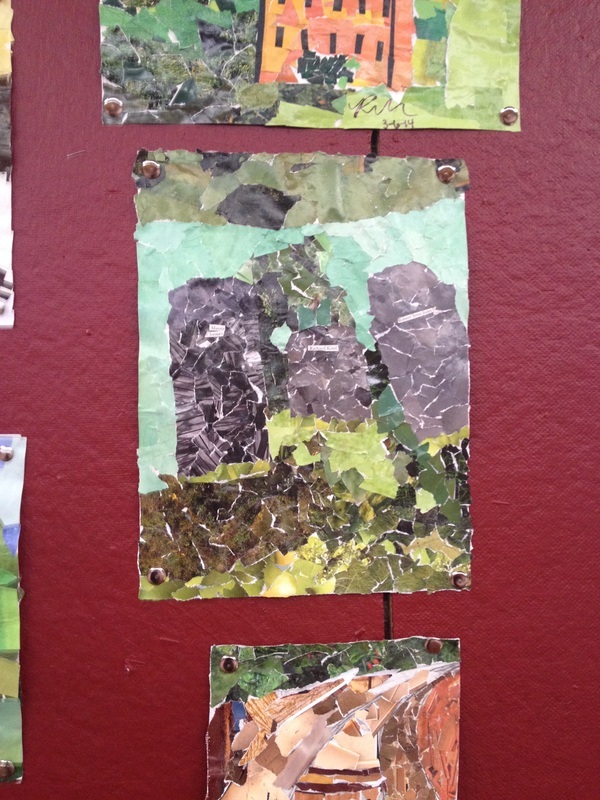 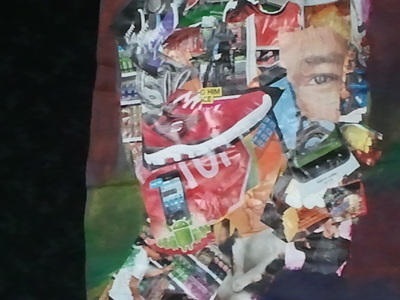 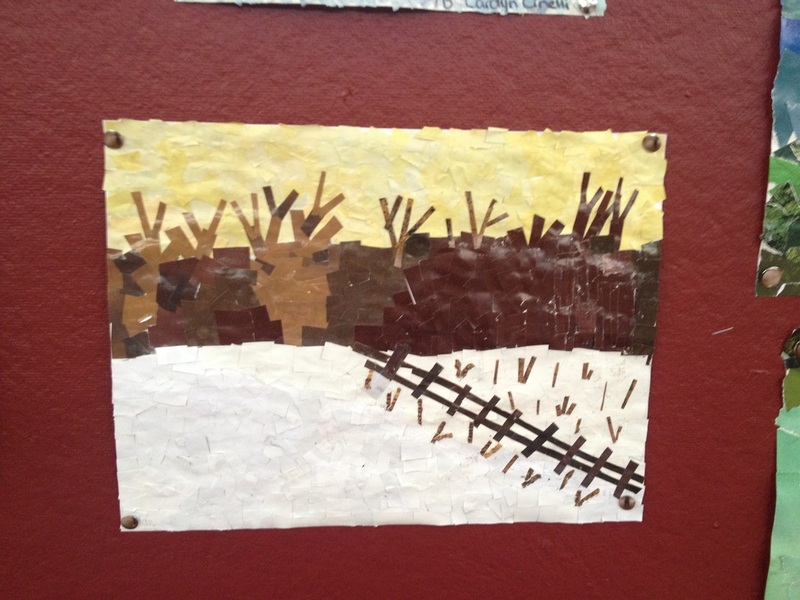 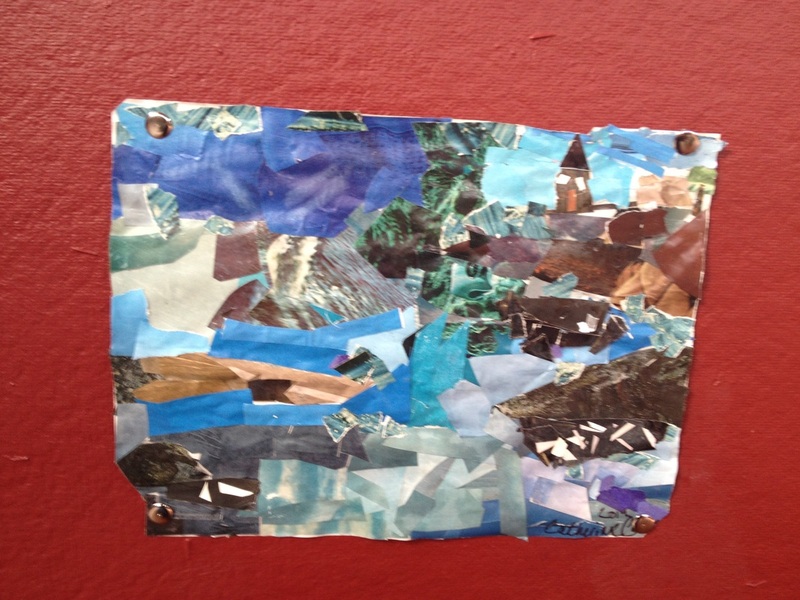 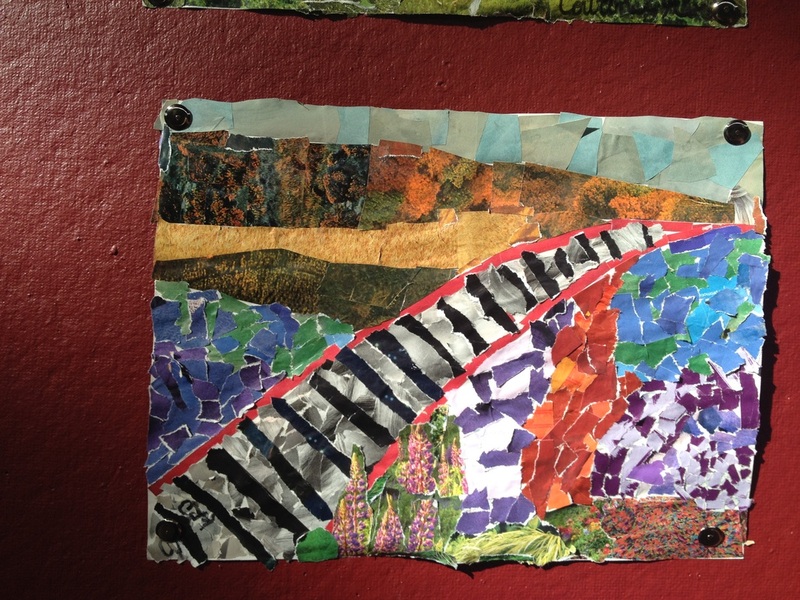 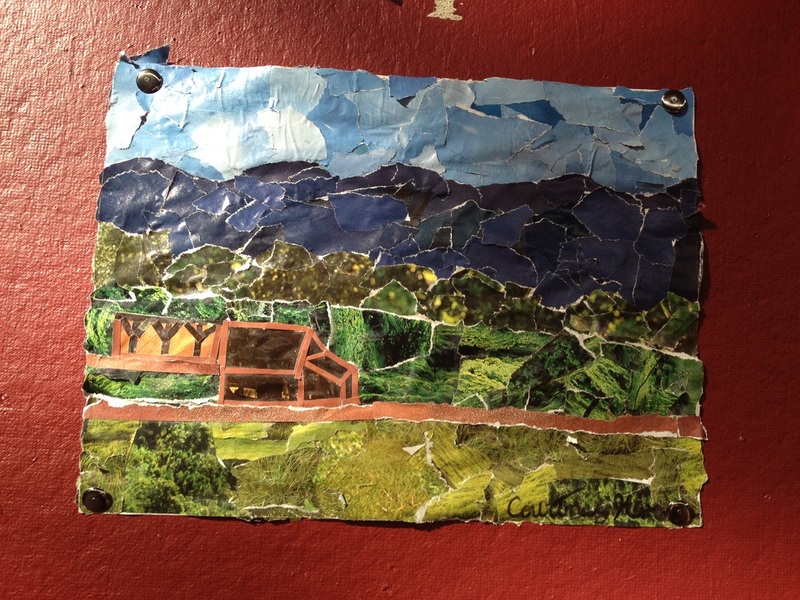 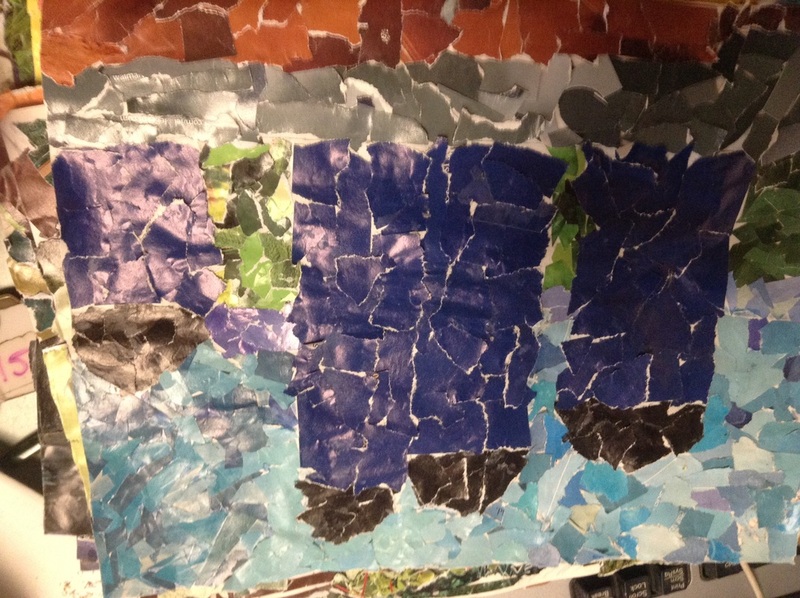 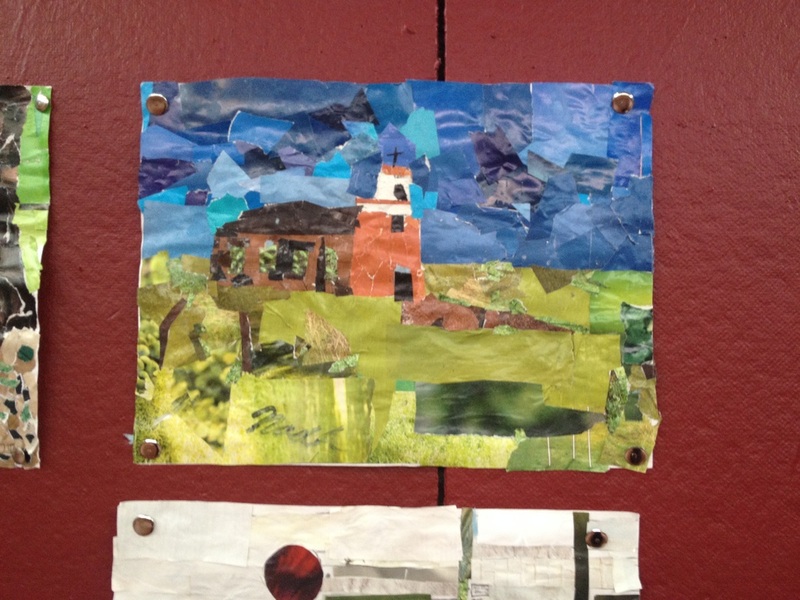 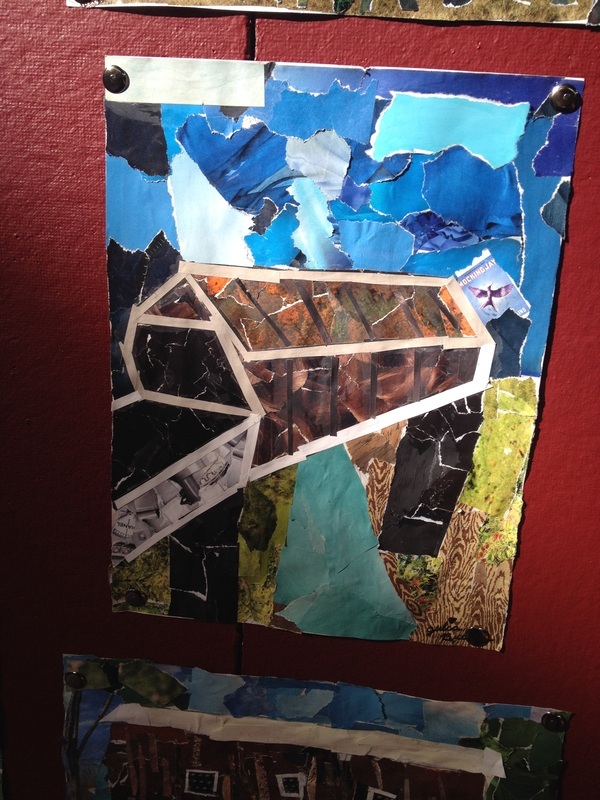 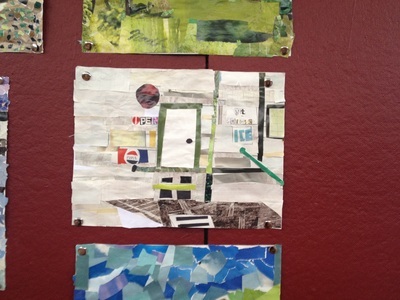 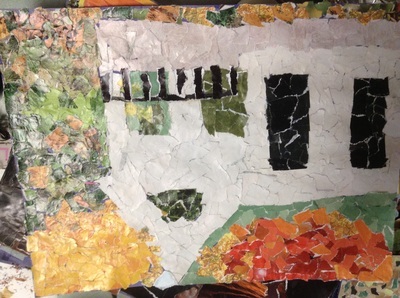 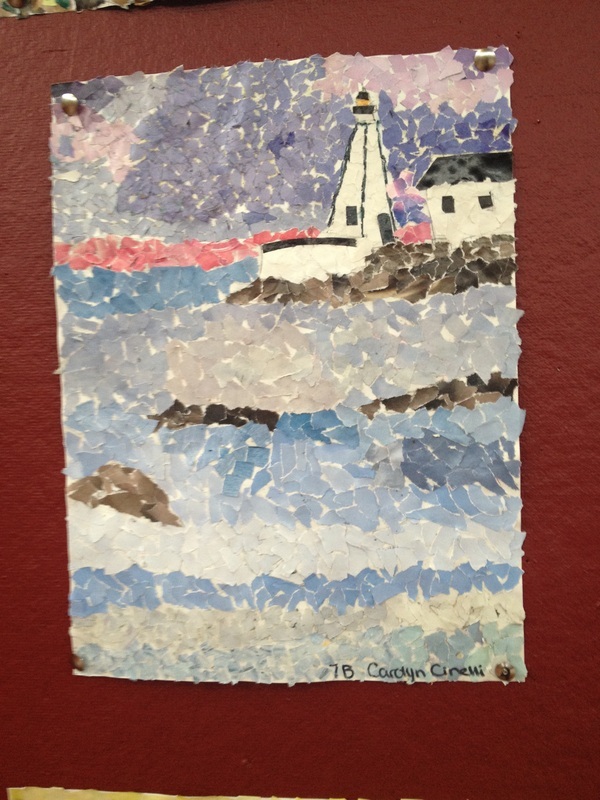 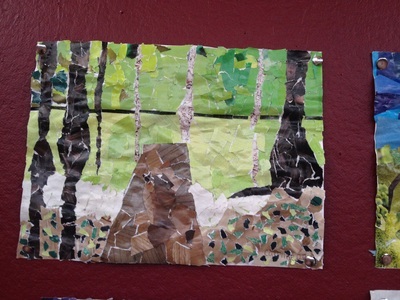 Through the process of collage, students learned to use recycled materials for art, that art takes time and giving their art the time needed creates amazing works of art, as well as putting certain colors close together can change the appearance of the color. The final products were stunning to say the least. 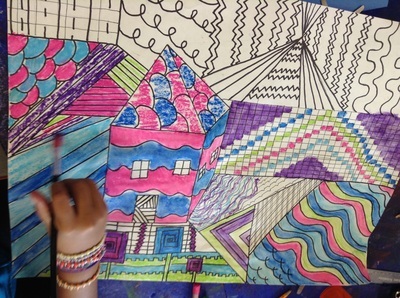 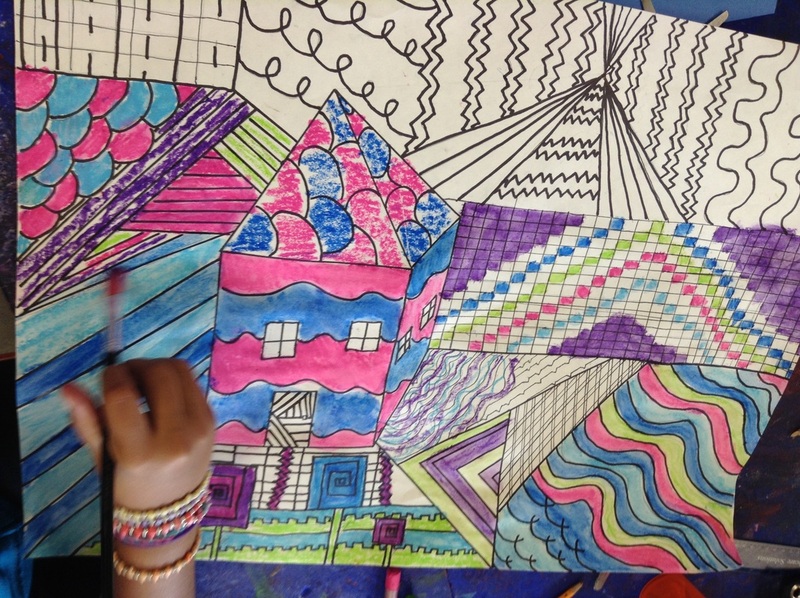 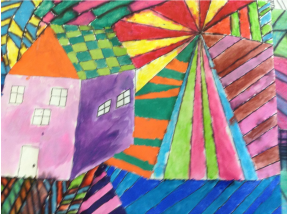 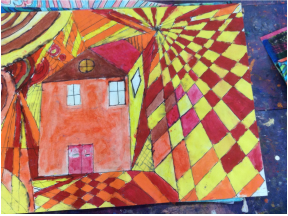 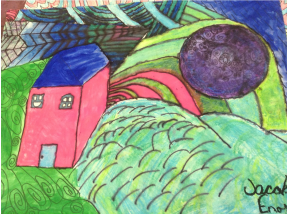 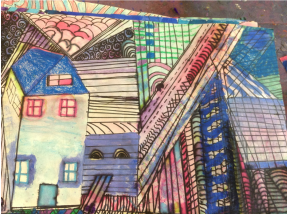 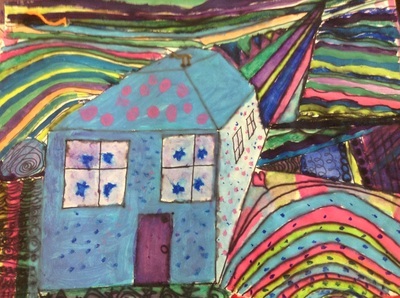 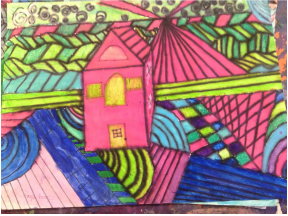 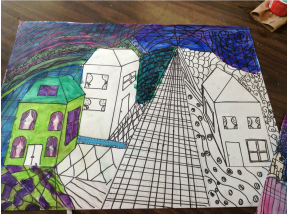 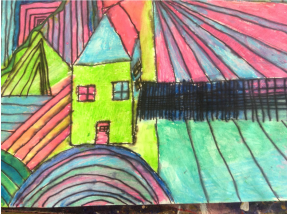 In this unit, 6th grade students used one point perspective and line design as well as warm and cool colors to make an original and creative landscape. 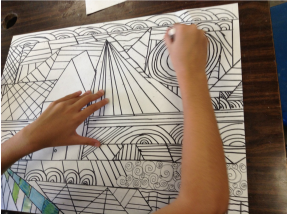 Students also learned about composition and how line can be exciting in a work of art. 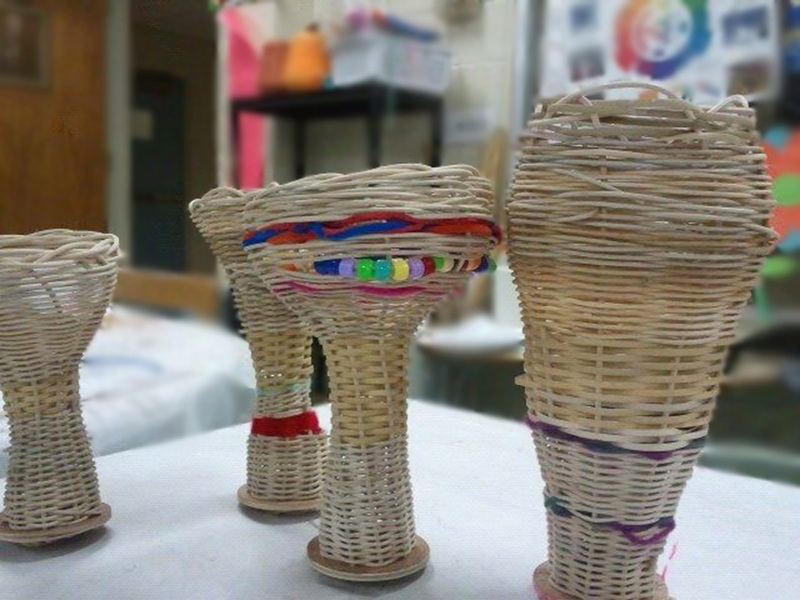 Students made baskets using traditional and contemporary materials. 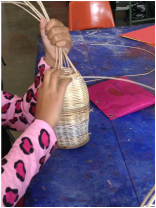 Students gained knowledge of the different materials the Cherokee nation used in their weaving pre and post European settlement. 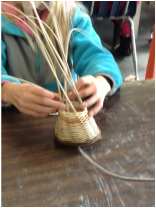 In weaving their baskets, students used vine, river cane (traditional Cherokee weaving material), and contemporary materials such as pipe cleaners and yarn. 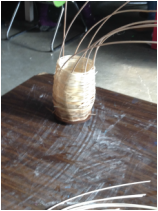 While utilizing vine and river cane, students were able to compare the characteristics of the materials. Most students favored the river cane as it was easier to weave, less brittle, and could be woven quicker than the vine. 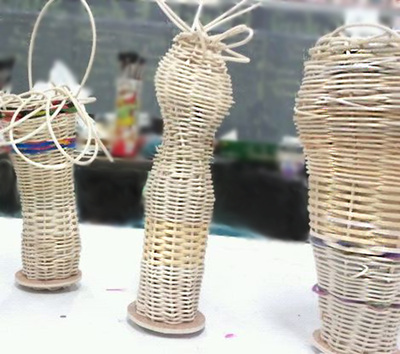 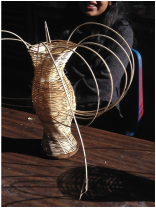 Students were encouraged to use contemporary materials to put a personal touch to their work as well as work with tension to create a contemporary shape for their baskets. 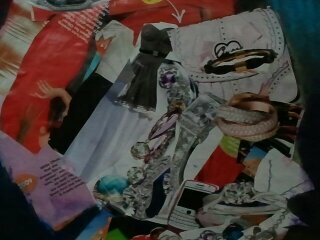 During the Renaissance and Baroque periods, life in Europe was rather good. 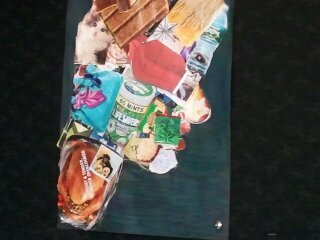 Food was plentiful, people were educated, the arts were raging through the continent. 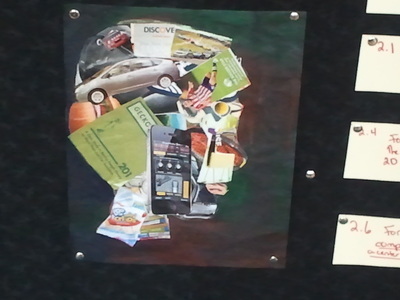 With education comes critical thinking, and with critical thinking comes change. 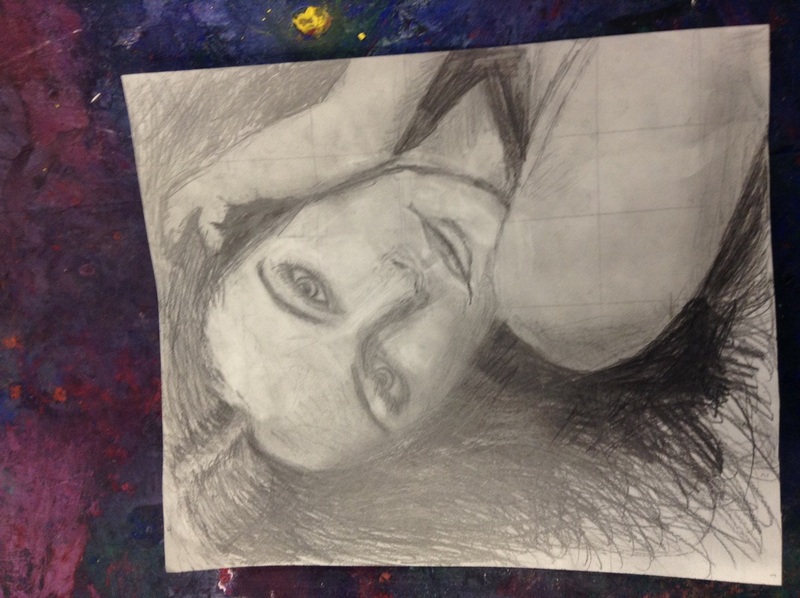 Many artists in the Renaissance and Baroque periods used symbolism in their works. 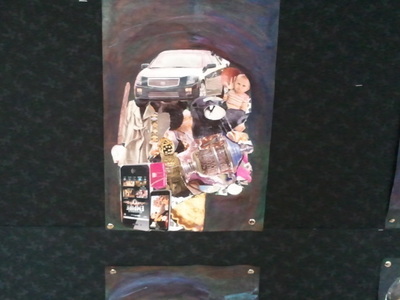 Their symbolism could have been to portray someone in a certain light or to convey a taboo feeling about their society such as feelings about the church. 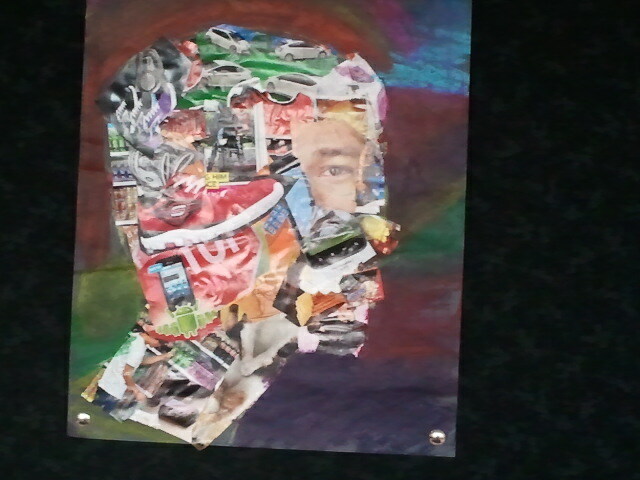 Artist Giuseppe Arcimboldo made portraits that were made with symbolism. 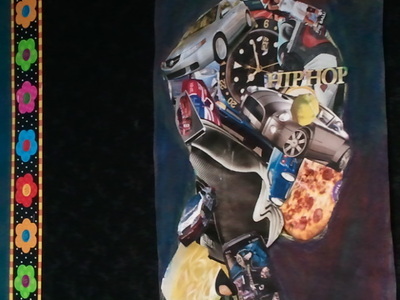 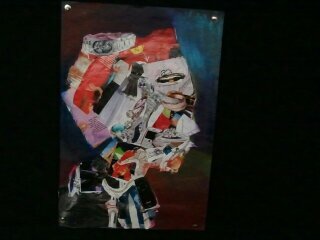 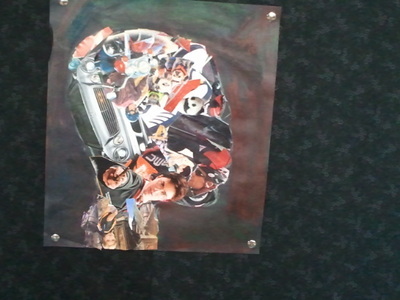 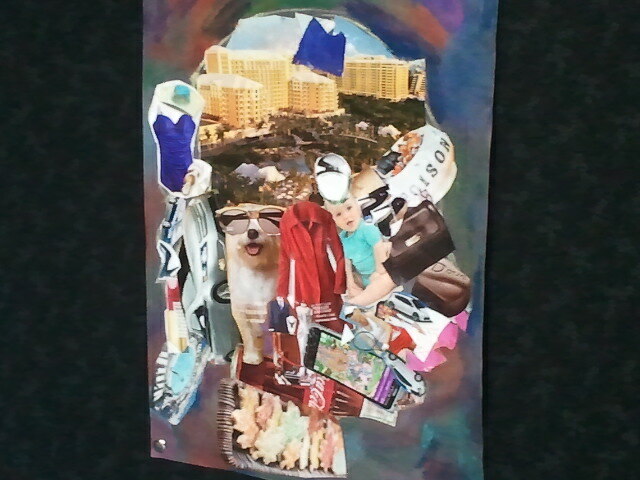 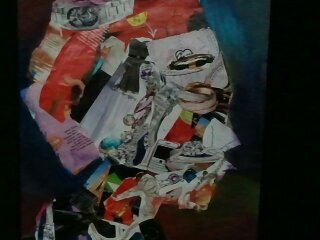 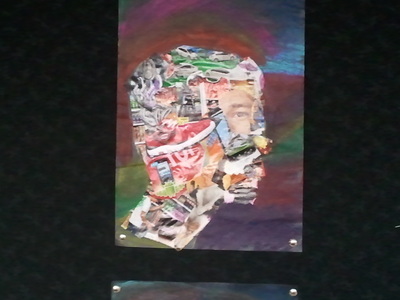 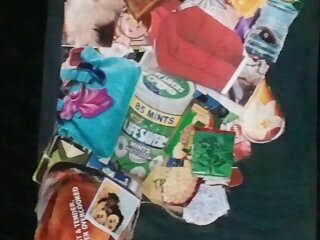 The work in this unit was influenced by Arcimboldo’s work. 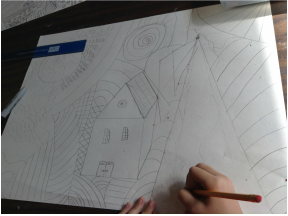 Students considered characteristics of their personality and conveyed these characteristics through imagery, diving into symbolism. 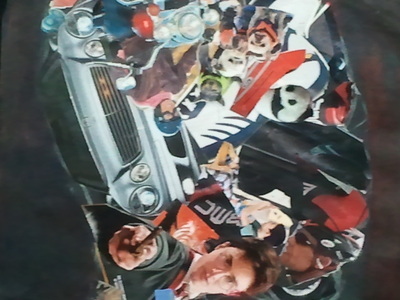 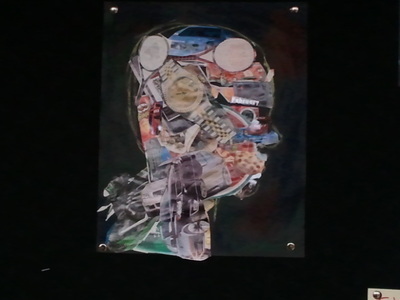 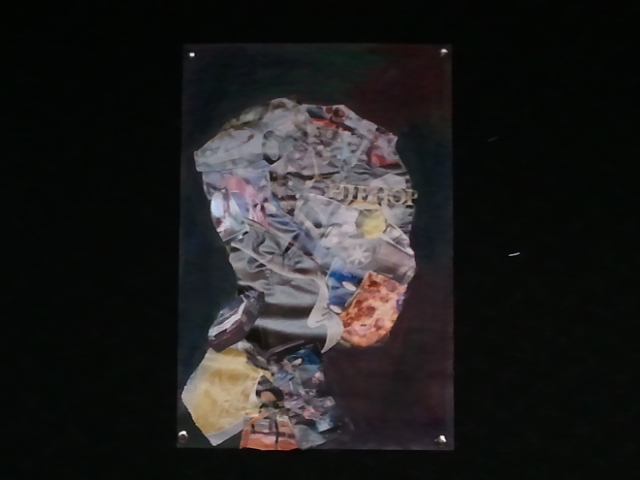 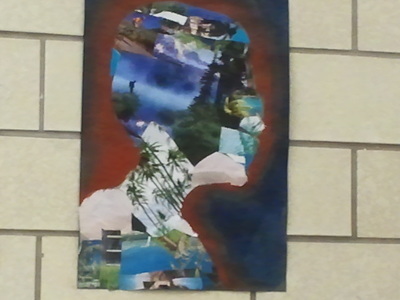 The images were then composed into a profile silhouette of the students' heads. 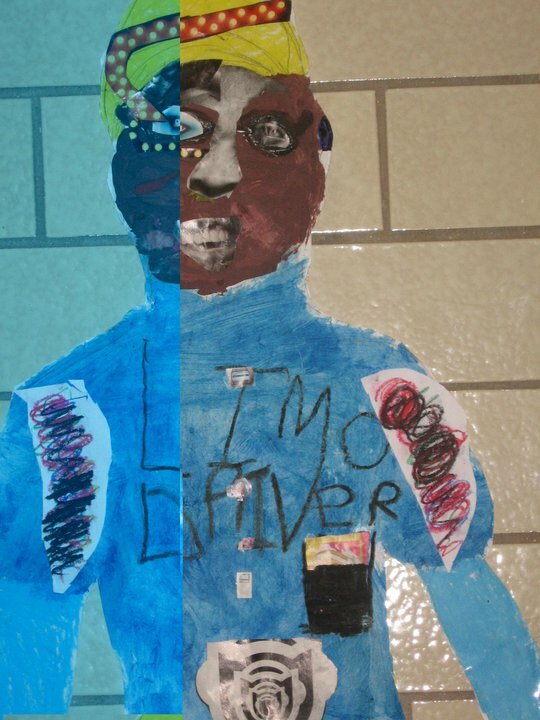 In this lesson, students considered more than things that they liked, they considered who they were as people, getting to know themselves on a deeper level. In this unit students worked as uniform designers designing new uniforms for people working in their community. 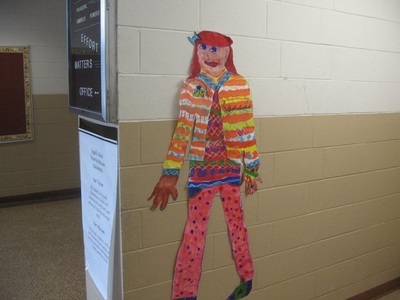 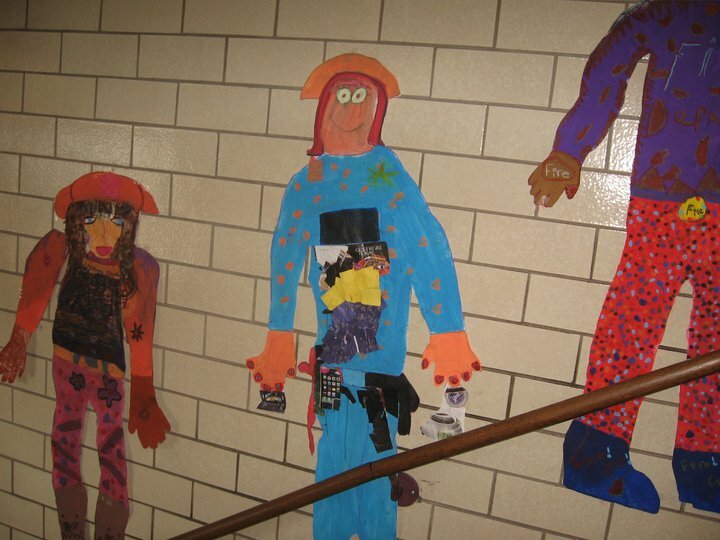 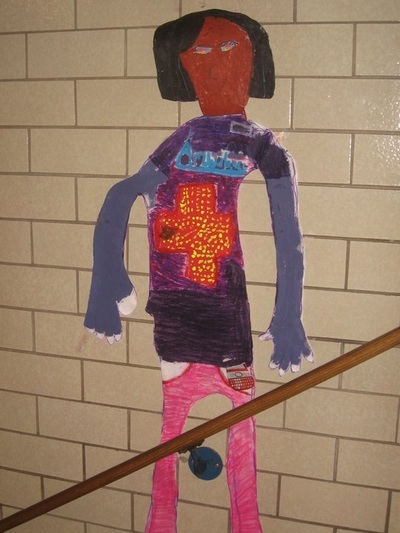 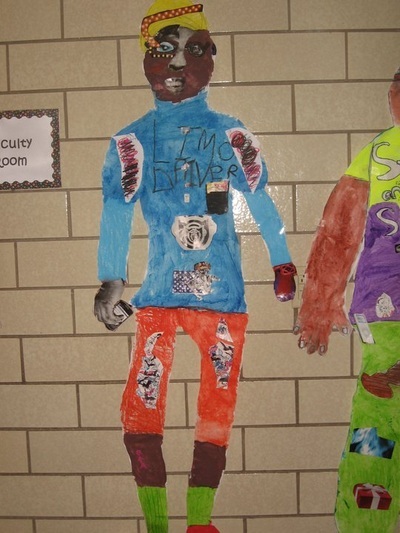 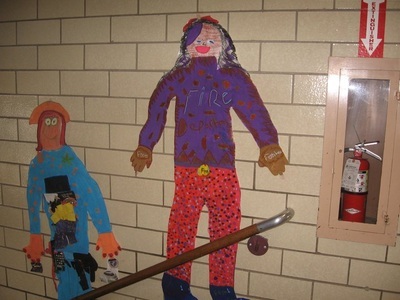 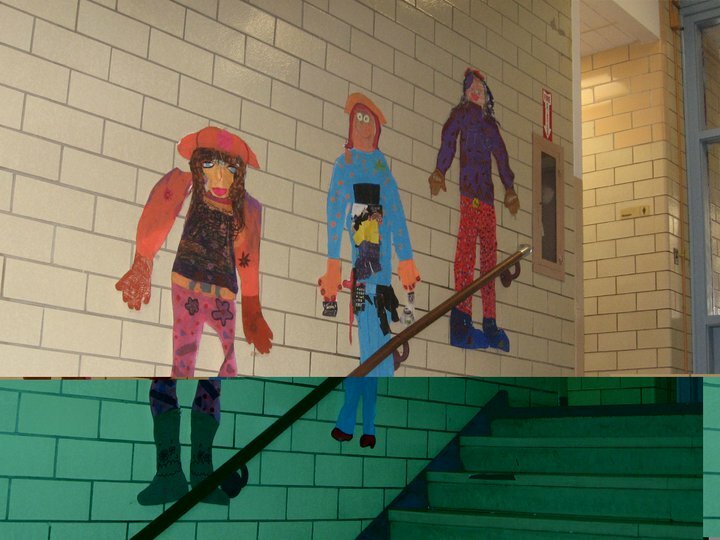 Students considered the workers' rolls but also were encouraged to outside the box when designing the uniforms considering the color wheel, pattern, the human figure, and their own style of aesthetics.